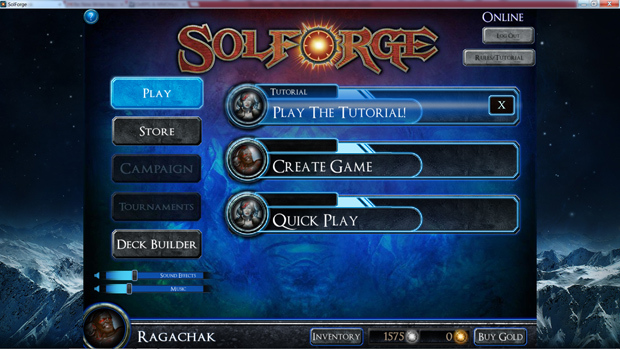 “SolForge” is a game created by Richard Garfield (Of Magic: the Gathering fame), and Gary Games (Ascension iOS game) to create a deck-building strategy game that did not require hundreds of thousands of dollars to simply play. The team that combined to create this digital card game has worked on over a dozen card games in their own right, including: World of Warcraft, Magic: the Gathering, Ascension, VS. (Marvel/DC), and the Star Wars CCG. The goal is to create a strategy game that the player can enjoy at any time, without investing their fortune into it. 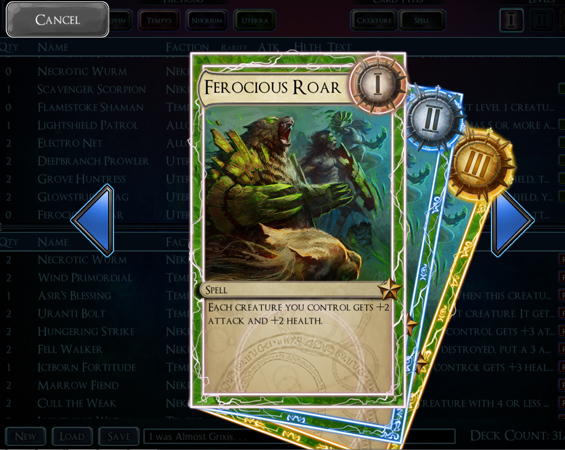 At its core, SolForge is a collectible card game. It is easy to play through the tutorial, and learn the core mechanics that make the game up. 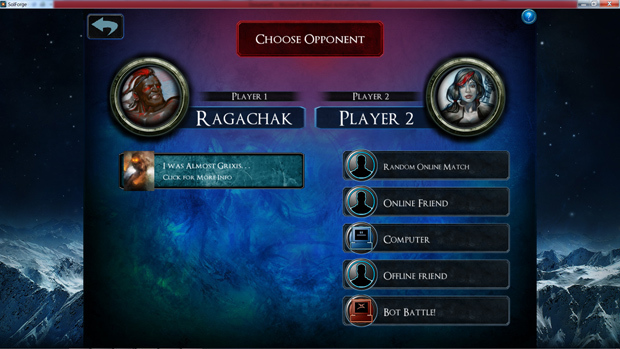 However, it is still a strategy card game: Just because you can play the tutorial does not make you a master just yet! The nature of card games is that they evolve constantly. New cards will undoubtedly make their appearance, and your opponents can teach you things you did not even realize. There could be new card combinations and strategies lurking just around the proverbial corner. Each player starts with 100 Life, and the goal is to bring the other down to 0. Both players start with five cards in hand consisting of a combination of creatures which are summoned onto one of the five lanes that face each other. These lanes are not just for show, though it may seem like it is fine to place a creature wherever you might wish to. 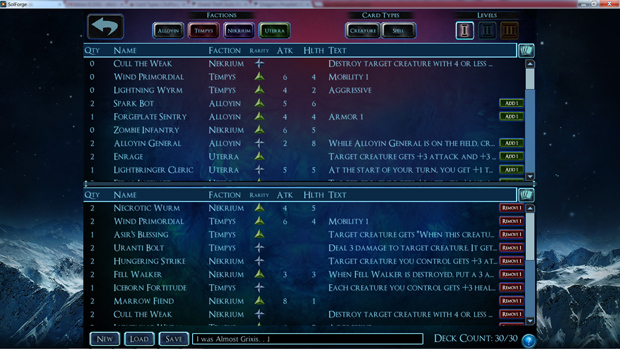 Creatures in a lane cannot attack those in an adjacent lane, unless there is an ability that would state otherwise. If it exists, I have not been lucky enough to see it just yet. On the first turn, only one spell or creature may be played, but after that, you may play two. It is worth noting that after each turn, you discard your hand, and draw a full new one. This can really put a crimp into strategies you prepare, if you were counting on certain cards to stick around. As the game progresses, there is a meter that fills with spells played, causing you to Rank Up. These ranks allow you to access better cards in your deck, or leveled up versions of normal creatures, which have starkly different abilities compared to their lower level predecessors. However, you cannot play spells or creatures during your opponent’s turn, unlike in Magic: the Gathering, where there are instants (spells that can be played at any point in time). The lanes are pertinent as well, because each turn you will attack with every creature you have, unless it has the “Defender” trait (It cannot attack at all, and only deals damage when attacked), or it has been just cast (Summoning Sickness in MTG). It becomes very important to not let a lane stay undefended for too long, because it could easily spell defeat. There are other traits worth noting, such as “Aggressive”, meaning it can attack on the turn it is played, as well as “Mobility”, which lets the creature move x amount of lanes once a turn, depending on the number. There are a variety of similar abilities to other card games, like “Breakthrough”, which is similar to Magic’s “Trample” in that its excess damage goes through and hits the player. 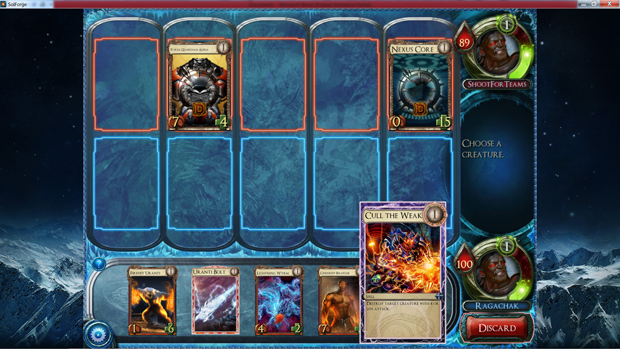 One of the positives about SolForge is the ability to create your own decks. A deck is comprised of thirty cards, made up of spells and creatures. However, you can simply use one of the pre-built decks offered to you; but where is the fun in that? You are given a few booster packs at the start to go with the assortment of cards they give you, in which you as the deck builder, can put together whatever cards in your collection, save it, and give it a snazzy name, as seen below. Tempys: The Tempys faction is a force fiddled with raw, elemental power. The Tempyrs embrace elemental powers, and some of the lucky among them can even bring these natural powers to their beck and call. Alloyin: North of the SolForge, the Alloyin Capital of Brightsteel stands out as a shining example: It is the way of the future. Technology, progress, a people marching ever towards the future. Those who command the powers of the Alloyin have a mastery of metal and synergy. Nekrium: As their name may suggest, Nekrium are the endless ranks of the dead. What fantasy card game would be complete without mindless hordes of zombies and skeletons to do your bidding? The Nekrium call their home in a necropolis from some long-forgotten time, and few humans remain alive in this haunted realm. Nekrium bring with them eternal life, with a price. Uterra: Uterra’s name implies Terra, or Earth. Beneath the frozen lands these various people call home, the Uterra faction exists as a reminder of the raw beauty and power that comes from nature. While Temprys is a pure magical force, utilizing attacks of ice and fire, Uterra is plant life, the ebb and flow that is nature herself. They believe in harmony and unity, that perhaps the factions could work together to reignite the SolForge, and bring life back to their wasted world again. This leads to a little bit of frustration. There are amazing cards in all four factions, and the want to use all four would be very high. But that is not the nature of this game! One to two factions in a deck will provide more than enough variety, a plethora of spells and creatures to push towards your opponent and secure victory. One of the major problems that I have seen in the match breakdown is balance. There seems to be very little in the way of balance in the game play. If you earn the early lead, it becomes a snowball effect in which your opponent has a very difficult time coming back, without some serious plays on their part. I played a few matches with a few of my old card game buddies, and the results were very slanted. The deck I ran “I was Almost Grixis. . .” (in a tribute to one of my favorite bands, ‘Megadeth’, and one of my favorite MTG themes ‘Grixis’) was played against my close friend who ran primarily soldiers, and machine soldiers. The entire outcome was generally decided by turn 2 or 3, due to the limited amount of spells you can play. Coupled with the mechanic of discarding your hand at the end of every turn and drawing a new one, you are really reliant on luck of the draw, and early game advantage. It’s terribly fun to be on the winning side, but faced with hopeless oblivion (as I was on more than one occasion) can be a little heart breaking. This leads to another problem with the “Free to Play” model. Microtransactions. In essence, you can use microtransactions to increase your card count, and make better decks than your opponents. Winning matches versus the computer, or against online friends nets you “Silver”, which is similar to “Influence Points” in League of Legends. These points can in turn be used to buy Booster Packs of cards, to increase your collection. Of course, there are better booster packs that you can buy using “Gold”, which you purchase with real currency; these are not required, and you can enjoy the game just fine without it. The name of the game is strategy and competition! You can play by yourself against computer generated opponents, but the real challenge lies in playing opponents around the world, not to mention your own friends on Steam. As of this writing, you acquire “Silver” via daily rewards: Logging in, play three games, win one game, and so on. There are three separate rewards you acquire each day. You must see the “You Win” or “You Lose” screens, otherwise it will not count. 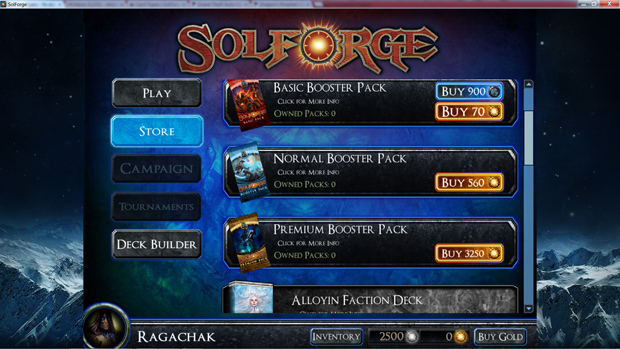 Despite it following the “money for cards” Free to Play model, SolForge does not make it a necessity to play and enjoy the game. It may take a little longer for you to acquire new boosters and cards that you want to seriously beef up your deck, but this is not a new model. Riot’s “League of Legends” has been very successful with this, and people who invest a great deal of time may wish to start spending money to become competitive. As with any card game, there is always the chance that online tournaments become a factor, and this could creature a fantastic new world of competition where individuals cannot buy single cards that cost over 100 dollars just to compete and win. I am incredibly eager to see how this game unfolds. As someone who has played collectible card games for about twenty years, including some online ventures, I am incredibly excited. The microtransactions put me off a bit, but not enough to discourage me from playing this to see where it goes. It is “free” after all. See you in game! Graphics: 3/5 – Graphics are not really a big deal in a card game. Though I wish I could see some of the art up closer easier. Controls: 4/5 – The controls are very solid, and respond without any hassle. I do however wish I could hover over a card instead of clicking/double clicking to view it. Features: 4/5 – It has all of the features I could hope for in a card game, except for a campaign. I suspect that will be in the regular release. Online, Online with friends, Bot Matches, Versus PC. 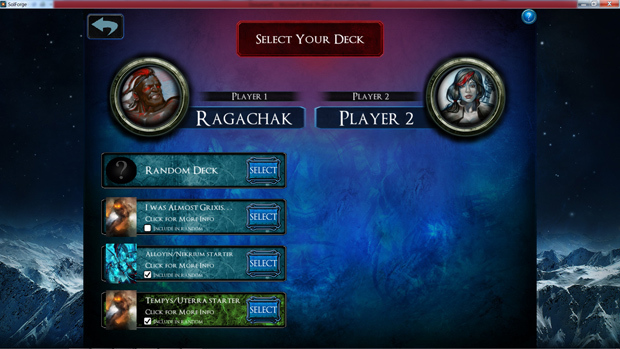 Customization: 5/5 – I was not let down with the customization, as I was with MTG: Duel of the Planeswalkers. I can customize every facet of my deck. Even only having two factions did not deter me from enjoying the customization this game had to offer me.